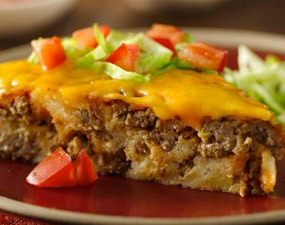 Enjoy this impossibly easy taco pie recipe made using taco seasoning mix and chopped green chiles that are ready in just 50 minutes – perfect for a dinner. 1. Heat oven to 400°F. Spray 9-inch glass pie plate with cooking spray. In 10-inch skillet, cook beef and onion over medium heat, stirring occasionally, until beef is brown; drain. Stir in seasoning mix. Spoon into pie plate. Top with chiles. 2. In small bowl, stir eggs, milk and Bisquick mix until blended. Pour into pie plate. 3. Bake about 25 minutes. Top with cheese and tomato; bake 2 to 3 minutes longer or until cheese is melted. Let stand 5 minutes before serving. Serve with lettuce, salsa and sour cream. • Try other toppings like shredded lettuce, sliced green onions, chopped black olives, guacamole or crushed corn chips. • Always read labels to make sure each recipe ingredient is gluten free. Products and ingredient sources can change.